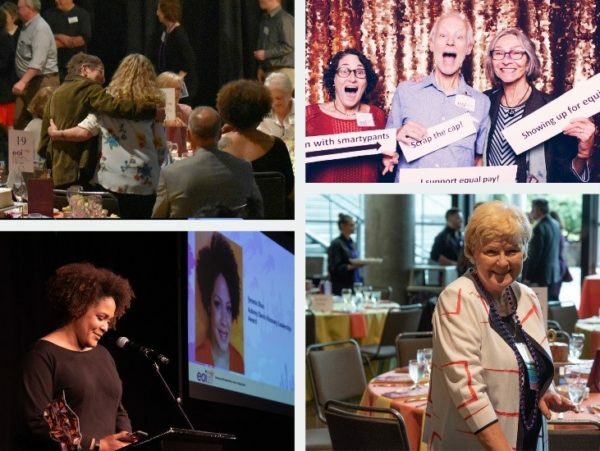 EOI’s Changemakers Dinner – September 19, 2019 5:30p.m. – 7:30p.m. Each year, our dinner draws supporters, activists, legislators, and friends to celebrate progressive policy victories and re-focus on our shared vision for the future. Join us as we celebrate another year of progress! Date: September 19, 2019 5:30p.m. – 7:30p.m. We’ll enjoy a cocktail hour from 5:30-6:30 with passed hors d’oeuvres, drinks, music, and policy-themed games. At 6:30, we’ll share a delicious meal and take in an engaging, educational, and inspirational program featuring winners of the Aubrey Davis Changemaker Award, a keynote address, and an artist spotlight. Are you interested in being a Sponsor or Table Captain for this year’s event? Click here to learn more or sign up! We invite you to come in from the cold and join us for an evening at the Economic Opportunity Institute. 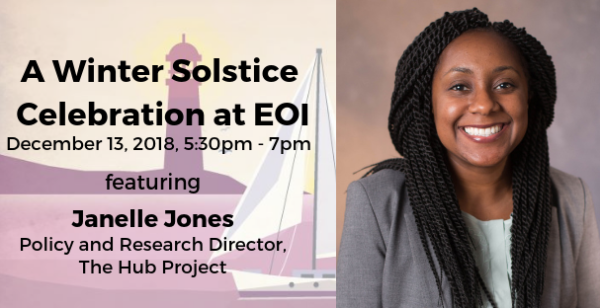 We’ll provide light refreshments and best of all, we’ll be joined by Janelle Jones, the Director of Policy and Research at the HUB Project, an organization advancing progressive campaigns to build a more just economy. Janelle brings a rich background of policy work at the Economic Policy Institute and the Center for Economic Policy Research and a forward-looking agenda for policy progress at the state and federal level. Janelle’s work has focused on worker compensation, household income, and racial economic disparities. We are excited to invite Janelle onto our board for 2019! Join us for a cocktail hour of wine, cheese, snacks, and non-alcoholic beverages followed by a short program and question-and-answer session with Janelle. This event is free, but space is limited. We encourage you to register at bit.ly/OpenHouseEOI to secure your spot. Don’t hesitate to reach out to melanie@eoionline.org with any questions. We hope to see you soon!